On June 4, 1775, the First Provincial Congress met again and embraced many of the acts and requests of the 2nd Continental Congress. South Carolina adopted the Act of Association and the American Bill of Rights - tying its future to that of the other twelve colonies, united yet separate. During this session, the First Provincial Congress resolved to continue with the existing Militia system by authorizing each of these to re-up their volunteers whose terms had expired. 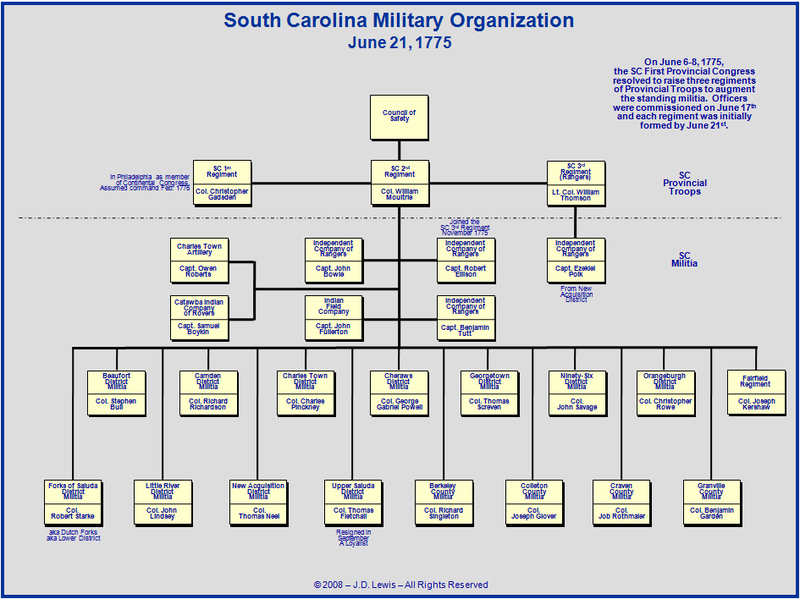 Although the 2nd Continental Congress wanted South Carolina to raise and provide three regiments for the Continental Army, the First Provincial Congress would only agree to raise three regiments of Provincial Troops - to be a standing army paid out of the Colony's coffers - in addition to the Militia that continued as volunteers. They did not agree to put these three regiments on the Continental Line since South Carolina was so far removed from the current/ongoing battles in the northern colonies and the colony would likely need these regiments for its own protection. These three regiments of Provincial Troops were initially formed by June 21, 1775 - and all officers were elected by the Council of Safety, and not by popular vote within each regiment or company. Since the Charles Town District Militia had so many volunteers, this group was hardest hit with drafts of men to fulfill the needs of the three new Provincial regiments. However, all other militia groups were affected to some degree. Additionally, the three Provincial regiments were authorized to go outside South Carolina to recruit men, and each did so - with a small number of men arriving from North Carolina and Georgia - to be paid for their services on a steady basis, rather than getting paid as a volunteer only when they were on active duty (which wasn't happening as yet). As had transpired earlier (in February), the new calls for Militia resulted in more than the First Provincial Congress had expected or wanted, but they simply could not refuse those volunteering - especially since they didn't have to pay for them unless they were actually engaged in hostilities. With William Moultrie assigned to lead the SC 2nd Regiment, and with William Thomson assigned to lead the SC 3rd Regiment, there were two significant vacancies within key Militia units - the Charles Town District and the Orangeburgh District. Two very capable leaders were selected by their consituents - Charles Pinckney and Christopher Rowe. The remainder of the Militia groups retained the same leaders as before. All six of the Independent Companies formed in February remained intact in June 1775 - however, Capt. Ezekiel Polk was ordered to report to Lt. Col. William Thomson of the SC 3rd Regiment, while the other five remained under the orders of the Council of Safety. Capt. Robert Owens was authorized to raise a new independent company of artillery to support the Charles Town Militia. At this point in time, the royal Governor Lord William Campbell had finally arrived in the colony and quickly found a cool reception from the growing number of Patriots in and around Charleston. He also quickly learned who his friends were as well, and these he met with at his earliest convenience. By the end of August 1775, Gov. Campbell shut down all formal governmental business being done on behalf of the Crown and retreated to an armed cruiser in Charleston harbor and began determining how to best thwart the plans of the Patriots. He collaborated with the ex-Governor of North Carolina, Josiah Martin, and many significant Loyalists to come up with ideas and plans to bring the "rebels" back under the Crown. By the end of September, the locals had scared him sufficiently that he left Charleston for good - but, his ideas and plans were already underway. It would take another year to get rid of the pesky British fleet.